RBA Cuts Rates to All-Time Lows! During its last interest rate statement in April, the RBA held rates steady at 3.00% but hinted its openness to further easing down the road. At the time, RBA head honcho Glenn Stevens mentioned that inflationary pressures weren’t too strong and that there was room for more easing should it become necessary. However, markets still weren’t quite sure if the RBA would go ahead and slap the markets with a rate cut anytime soon. Those in the dovish camp said that the recent weakness in inflation and economic growth would be enough for the central bank to take action. They pointed out that inflation for Q1 2013 printed at 0.4% which disappointed forecasts for a 0.7% uptick. On the other hand, a few market junkies said that the RBA would probably wait for more signs of weakness before actually pulling the trigger. But alas! The doves won. Earlier today, the RBA lowered rates by 25 basis points down to 2.75%. In his accompanying statement, Glenn Stevens said that a rate cut was only appropriate in light of recent economic developments, as the Australian economy appears to be growing at a slower pace. Slashing rates by 0.25%, the hope is that this would help the economy sustain economic growth while allowing the RBA to be within its inflation target range of 2%-3%. So the RBA just cut rates, the Aussie is sure to get sold-off in the next few days, right? Err, don’t get too excited just yet. In case you’ve forgotten, the RBA also cut rates back in December 2012 and contrary to what most market participants were expecting, the Aussie rallied following the announcement. Some argue that the reaction might have only been because a rate cut was already priced in. However, it may have also been because the RBA hinted that they wouldn’t cut rates anytime soon. With that said, you should take into consideration the RBA’s monetary policy outlook before you bet the farm shorting the Aussie. This might be easier said than done though. The bank’s statement doesn’t really drop any hint on whether we’ll see more rate cuts or not. My guess is that the RBA will determine its next course of action according to the reports that will be released from Australia in the coming weeks. Of course, that’s just my two cents. What do you think? 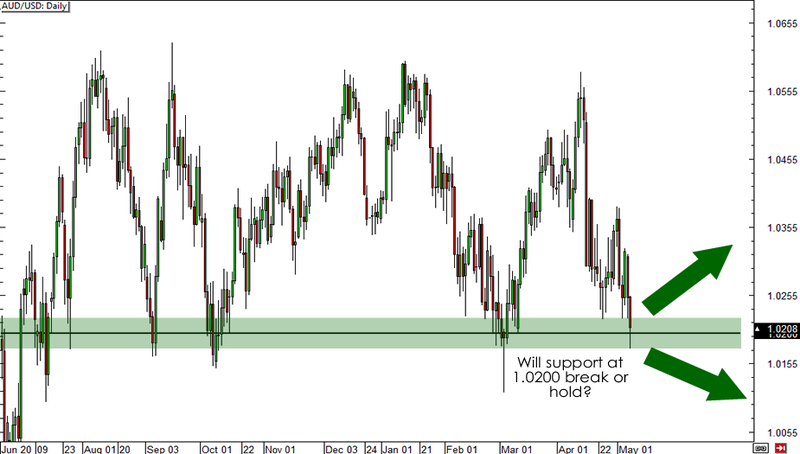 Will we see a sustained sell-off on AUD/USD enough to break support at 1.0200 following the rate cut? Or will the level hold? Do you think the latest RBA rate cut will be enough for AUD/USD to break support at 1.0200?